This is the last post in the Pass the Energy Please series. It contains tips on how to prepare your aerobic energy system for dragon boating. If you have read the preceding posts in this series you will know that some anaerobic training can be catered for with high intensity interval training (HIIT) – go extremely hard in short bursts (“bust a foo-foo valve” ) and then have a long break. Aerobic training couldn’t be any more opposite. Some of the concepts presented here may seem a little weird and probably quite hard to implement as it seems counter intuitive. However, do it correctly and you will set yourself up for a great season. 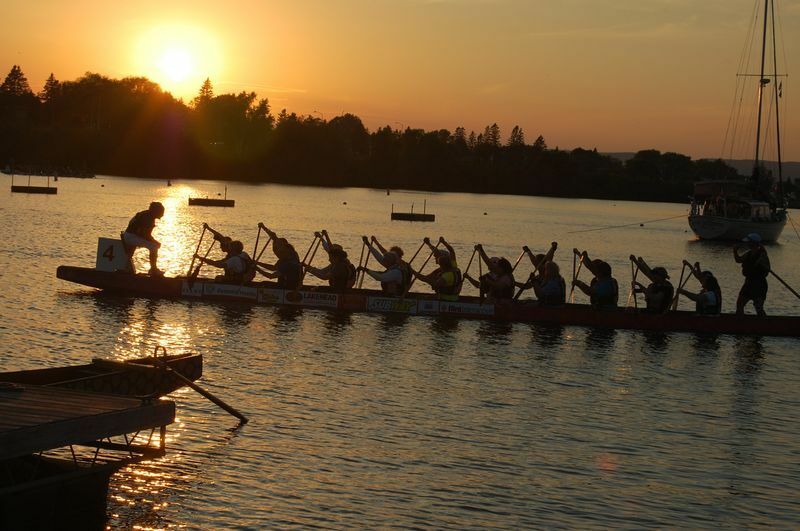 At the end of a dragon boat season with its intense training, it is very difficult to bring the speed and the pace right down. But if you have the discipline to switch into training aerobically for a period of time, when everyone else is still training full on, it will pay you dividends in the long run. First step, take a break at the end of a dragon boat season. A 3-4 week transition phase at the end of each season followed immediately with base training is the goal. The transition phase is the time to rest and recover both physically and mentally. Do not stop totally because the amount of fitness you will lose will take a long time to make up again. Instead keep active but include plenty of rest. Enjoy the calming and aesthetic side of dragon boating. If you don’t transition and, instead train hard year round without taking regular periods of reduced volume and intensity, you could find yourself burned out, over trained, and perhaps injured. Your performance will degrade rather than improve. As we have spoken about in this series, there are two basic energy systems you use when training; anaerobic and aerobic. It is difficult to build both your aerobic and anaerobic systems at the same time effectively. So base training is designed to target your aerobic energy system specifically. Produces muscular adaptations that improves oxygen transport to the muscles. Reduces the rate at which lactate forms. Improves the rate at which lactate is removed. Increases the production and utilization of energy. As an added bonus this adaptation helps post exercise fat metabolism as well. This is not necessarily of much value in a sprint sport such as dragon boating, but, hey, it’s one way of getting rid of unwanted fat! Increased stroke volume of the heart - means that your heart pumps more blood per beat. Increased capillary density – allowing us to effectively transport more blood to the working muscles. Because high stress training breaks down capillaries, base training is best for allowing the slow growth of capillaries. Increased mitochondrial density - Mitochondria are structures within muscle cells that produce energy from fat and carbohydrate oxidation. Think of them as tiny batteries for muscle contractions. Regular endurance training can double these structures. Fat is a primary fuel source for the aerobic energy system. Level 3 – World Club Championship and International - 12-16 weeks of base training. Level 2 – Local and State Championships - 08-12 weeks of base training. Level 1 – Recreational - 04-08 weeks of base training. Over the course of the base fitness phase you should progress from the low end of the aerobic energy system and gradually proceed the high end. Use heart rate zones that fall into the 70-90% range of lactate threshold or 60-80% of max heart rate. Include low cadence paddling (<60 strokes per minute), low cadence cycling and slow hill running or even walking. These work outs also increase in volume throughout base. This is a sample chart to get you started but it is better to get yourself measured. increase later in the season it is harder for the athlete to concentrate on technique. By establishing good technique early in the season the athlete will carry them forward into the season. Training at low intensity can lead to boredom so it is important to keep the athlete's mind moving with drills and technique work. Base training does not mean you will never move fast. Variations in stroke length, and stroke rate can all be integrated. Towards the end of base training phase you can include power work but use brief durations and full recovery between efforts. The hard part of base training is having the discipline to train at these low intensities. It may mean 10km paddles, running very slowly or even walking. However, even spending short amounts of time above your aerobic zone degrades the work out. During base training you need to avoid the area between the top of the aerobic threshold and anaerobic threshold. This area is a mix of aerobic and anaerobic states. For the amount of effort you would put forth, not a whole lot of fitness is produced. It does not train the aerobic or anaerobic energy system to a high degree. This area does have its place in training; it is just not in base season. Unfortunately this area is where a lot of paddlers spend the majority of their seasons, which will hamper aerobic development. The athletes heart rate shoots up to this zone with little power or speed being produced when it gets there. Zones are used to guide you through base training so it is important to have an accurate idea of your zones. Regular performance tests by the paddlers under the guidance of your coach will ensure their zones are correct and to confirm their training. After performing these tests, you will get a very clear estimate of lactate threshold. Then you can use a percentage of LTHR to determine individual zones. Seek clinical testing to determine your zones if you are paddling at the highest levels. Recalculate your training zones regularly. Do this base training properly and your fitness will improve, and your zones may no longer be accurate. You could end up spending an entire base training season training the wrong energy system. It is important to note that your anaerobic system will suffer during base training. You will lose some of your anaerobic endurance and the ability to sustain speed near lactate threshold. You will also lose some top end coming out of base, but this is what you are going to spend the rest of your season working on. It often takes several seasons to see the result of sound base training if you are a novice paddler. Be patient, it is a process that is slow and cannot be rushed, but the sooner you get started the faster you will be.